Observed at Kitale, Kenya, Africa. April 2011. Identification to genus by Dr. James Trager. 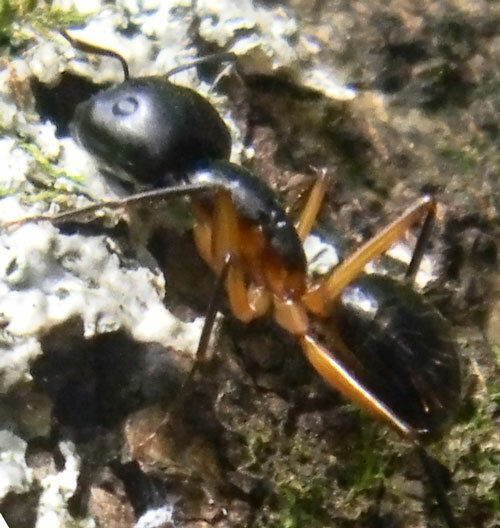 Camponotus is a large genus of ants that very often nest in old, dead wood. Many species are strictly nocturnal, while others are diurnal. Camponotus are a frequent component of arboreal insects fauna, where they are important predators of insects and other invertebrates. Dead or moribund insects may be taken. These ants can produce sharp concentrations of formic acid (HCOOH) that can be sprayed acurately at attackers. Thus most birds and lizards avoid taking carpenter ants as prey. Copyright Michael J. Plagens, page created 22 Novenber 2011, updated 1 December 2011.